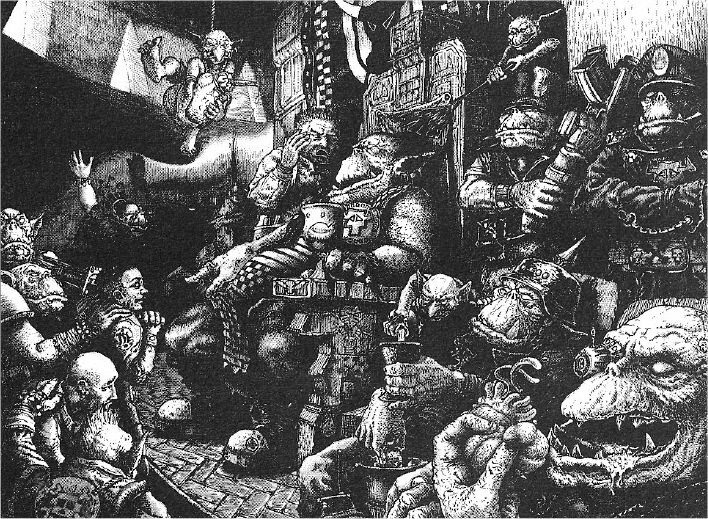 Before the Necromunda game was released in 1995, the basis for the setting was established in a series of articles in White Dwarf magazine in 1990-91. 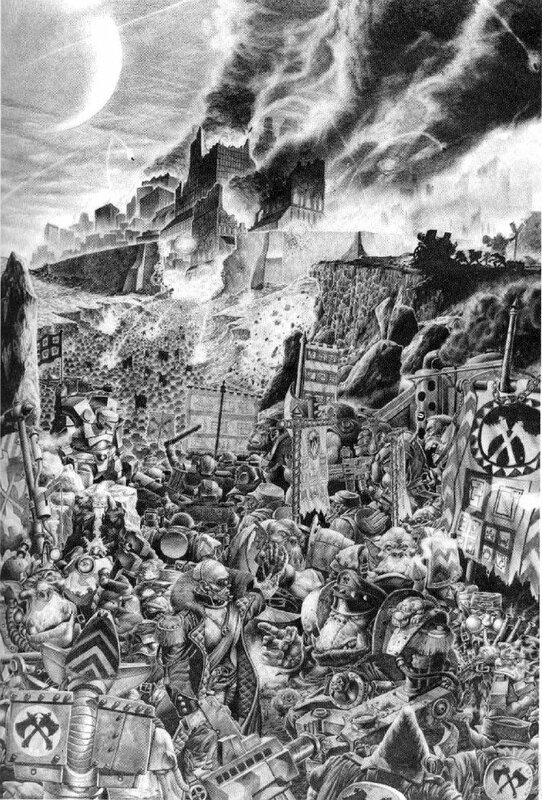 There was a rule set associated with that background called Confrontation (not to be confused with the Rackham game of the same name) which was also printed in White Dwarf. Disrespectful Snotling gets his close-up. A small range of miniatures was released for the Confrontation game in 1990-91. This model is a Bounty Hunter from that range. I bought the model in the mid-late nineties with the intention of using it as a VIP/objective counter piece in my Necromunda games. Although I quite like the figure, when it showed up the character didnt quite look as affluent and suitable for VIP use as I had been hoping. Those EMF shorts dont exactly command respect. Although the models original role was supposedly that of “Bounty Hunter” it also didnt really look how I imagined a bounty hunter in Hive Primus would look, so I didnt want to use it as that either. Blood Axe Human Adventurer Unit. Recognise the guy at the front? There was an army list for each of the six ork clans back in the RT days, each with a few minor differences in available options, supposedly to encourage theme. 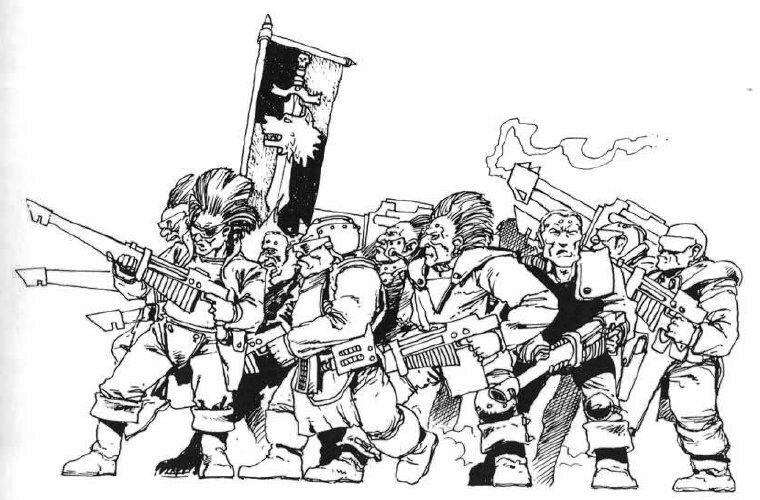 The Blood Axes were one of the more extreme in that they had access to Imperial equipment, human mercenaries, Ripper Gun equipped Ogryns and undercover Imperial Guard. Most importantly from my perspective, the Warboss had a Human Advisor. I decided to paint the bounty hunter figure to fill that role in my Bigdogz ork project. 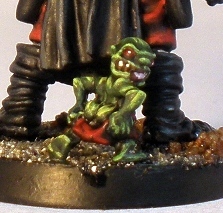 In the background the Human Advisor is an undercover Imperial Guard officer and wears the sort of attire appropriate to that position, but with an orky colour scheme. Presumably the intention was that players would use an Imperial Guard officer miniature to represent the Advisor. Considering that the Blood Axe trappings are very militarised and ape the Imperial look to a large extent, that approach seems perfectly appropriate. 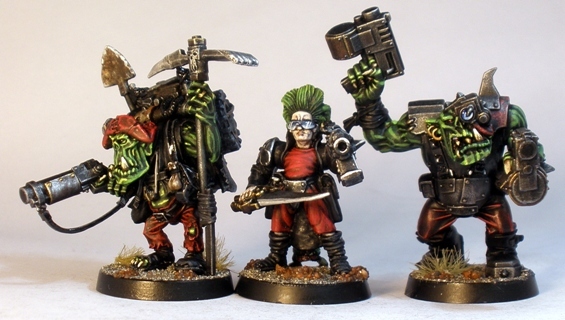 Modern ork models dont really look as military as they used to though so an Imperial Guard model would look less appropriate now. 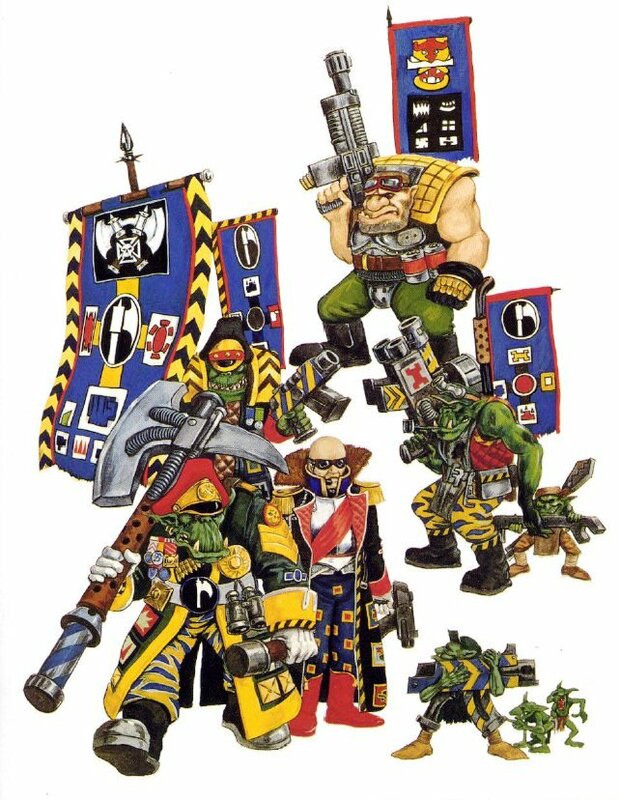 My ork force contains orks of all sorts of persuasions using the same palette, so I dont really regard the army as being a Blood Axe one (or any other clan affiliation either, although the scheme does look quite Goff). I am very happy to have the opportunity to paint the sort of oddball human who might hang around with orks anyway though: its too entertaining an idea to leave out. So I decided to use the Bounty Hunter model instead of a Guard officer to represent a human who may or may not be of Imperial origin who has added a few ork trappings to his appearance. The arms came from Mantic plastic orx Marauder grunts. Mantics orx are a little less heroic in scale than current GW orks – they are more like RT orks really – which meant that a pair of those arms was quite passable on this human model. I imagine that he wears the spiky stuff to fit in in the Warboss “court”, if you know what I mean. 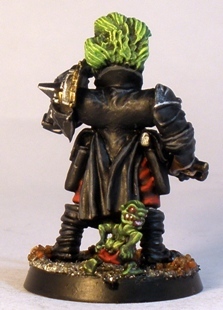 Any human hanging out with a bunch of ork nobz must be well able to handle himself, so I equipped the Advisor for close combat, with a pair of officers weapons: a bolt pistol and a power sword (an RT era ork power sword actually, which I quite like the look of in this context). In terms of colours used in painting, other than the human flesh tones the Advisors palette is identical to the rest of the Bigdogz. The green ork flesh is an important part of the contrast in the Bigdogz scheme, so I painted the hairpiece using the same colours. 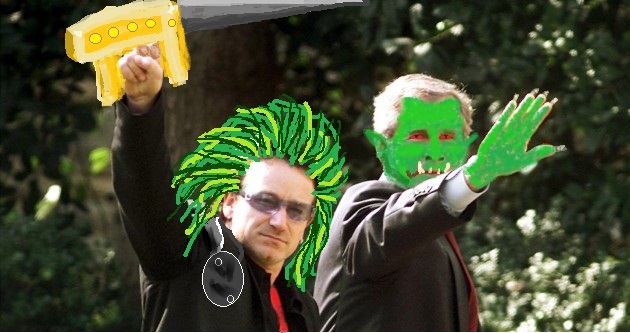 Obviously the snotling was painted as I would any other greenskin. The Bigdogz are badly in need of a Boss at this stage. I have two non-mega-armoured miniatures suitable and plan to paint them both eventually, but I need to get cracking. There isnt much point in an advisor without anyone to advise. 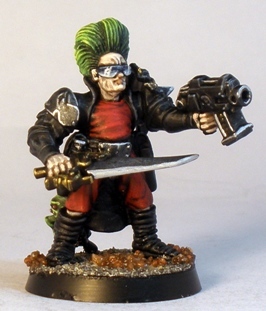 EDIT: after putting photos of this miniature up on the Oldhammer forum there was a flurry of people discussing how much the model looks like Bono or Kim Jong Il. theottovonbismark used the following images to hammer home his point. 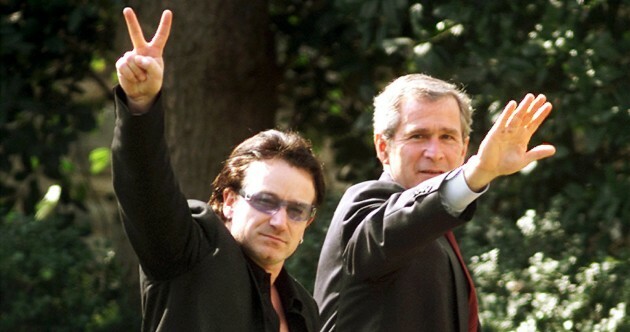 I found this very funny, so christened the little guy Kim Jong Bono. Excellent paintjob, I love the effect you achieved on his glasses. Another plus is to learn about these older, almost obscure, miniature ranges! Thanks daggerandbrush. The painting on Kim Jong Bonos shades has gone down particularly well. The GW Confrontation range is quite small and obscure by GW standards. It can be seen here and here on Stuff Of Legends.